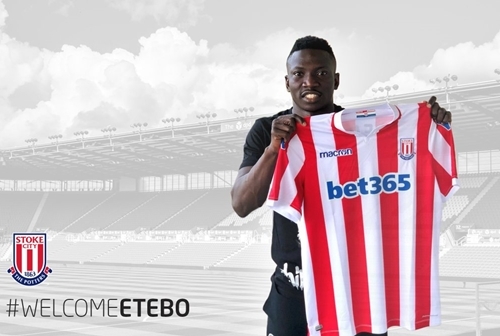 The Super Eagles midfielder, Oghenekaro Peter Etebo, became the first Stoke City signing of the summer before the new season. The 22-year-old midfielder, who is a member of Nigeria's team in Russia, signed a five-year contract after the Potters paid the Portuguese team Feirense € 7.2 million. Etebo spent the second half of last season on loan with Las Palmas in La Liga and will head to England after the World Cup. Stoke City Chief Executive Tony Scholes said: "We are delighted that Etebo has chosen to join Stoke City, becoming our first summer signing. "I am particularly happy that he took the time to look beyond our current league status and understand who we are as a club before choosing us before the current Premier League and Bundesliga clubs." Manager Gary, Rowett said: "We are very excited to have reached an agreement for Etebo, I am looking forward to seeing it with a Stoke City shirt, I am sure our fans are too. "Etebo is an energetic and very mobile midfielder and he is very old, he has played in the main divisions in Portugal and Spain and, of course, he is heading to the World Cup with Nigeria, which will be an incredible experience for him". Etebo has been international 14 times in Nigeria and entered as a substitute in last week's friendly against England at Wembley. He will be part of the Nigerian squad that will face the Group D matches in the World Cup against Argentina, Iceland and Croatia. Etebo, who started his career with Warri Wolves in his native Nigeria, joined Feirense in 2016 and made 45 appearances in the league, scoring seven goals. He made 12 appearances in Las Palmas as a loan with the Gran Canaria team.